Bushewood Building Company Directors, Tim and Matt, are both carpenters and joiners by trade. They work together with other highly skilled construction experts to turn your dreams for a new home into reality. If you’re in need of quick, stress-free timber frame installations, no one can do it better than our team of qualified contractors. We also ensure that the work is done on time and within our estimated budget. Our lightweight framed timber builds range in size and appearance. Whether you desire a traditional weatherboard bungalow or an ultra-modern home, our innovative contractors will do the job for you. These timber frame structures efficiently secure your loved ones from all harsh elements, including winter conditions. Whether it is for you floor systems or walls, timber frames are strong and they provide reliable frames and trusses. They are resilient and tough and can withstand the changing weather. We use the finest timber which is sustainably sourced from Australia to provide you with the best quality materials for your building needs. Since the timber is locally sourced and manufactured, you can be sure that the materials we use comply with Australian construction standards. Timber frame homes take less time to construct than houses made from bricks and blocks. 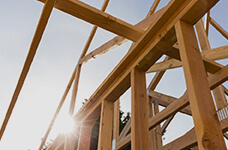 Timber frames can be erected faster and interior works such as electrical wiring and plastering also begin sooner. Timber frame structures have a low thermal mass, allowing your interior spaces to heat up more quickly than homes made of bricks. Contact our timber frame installation experts today to discuss your building needs and arrange a time for a quote.